The Top 10 Best Multitools Ever! As a pocket knife enthusiast I spend most of my time collecting, reviewing and of course using folding knives from today’s major brands like Spyderco, Benchmade, Kershaw, Buck and CRKT. Still, there comes a time when you need more than a one or two blade folder and since I was introduced to the world of multitools in the late 80’s I’ve been a fan ever since. Nothing comes close to a quality multitool when you need sheer sturdiness and practicality in an EDC form factor. In this article I will show you the absolute ten best multitools on the market today. You may be surprised to see that they’re ALL made by Leatherman – but you shouldn’t be. Leatherman is the undisputed king of multitools and simply unmatched in my opinion. Since Tim Leatherman built his first multitool and created Leatherman Tools in 1983, the Leatherman company has continued to innovate and demonstrate unrivaled quality. Their 25-year no-questions-asked warranty says it all. Take it from me, all you need is Leatherman. So, without further ado, here’s my list of the top 10 multitools. 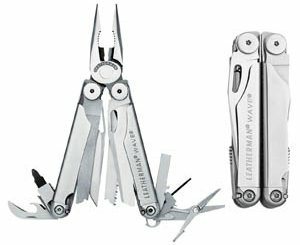 The vast majority of consumers should look no further than the Leatherman Wave. Of course, I’m talking about the New Wave which replaced the original Wave in 2004 and has ruled the multitool kingdom ever since. The Wave is now a full-sized multitool with 17 tools crammed into a superbly designed body that is small enough to carry. It includes 2 pliers, wire cutters, two 420HC knives (one of them is even serrated), a saw, scissors, a wood/metal file, a diamond-coated file, 2 drivers, a bottle opener, 2 double-ended bits, and more. The Wave is constructed of 100% stainless steel, and includes a lanyard attachment and a leather/nylon sheath. This multitool weighs in at 8.5 ounces, and measures 4” long and 2” thick. You can get your Wave in plain stainless steel or with a cool looking black oxide finish. 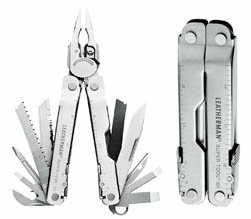 There’s a reason this has been Leatherman’s most popular model for over a decade – the design is ingenious, the quality is outstanding and the value for money is unrivalled. 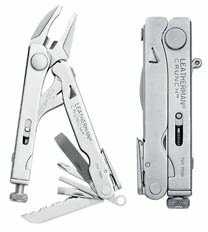 Don’t get me wrong, Leatherman has higher-end models for those with money to burn but the balance between features, quality and cost is just about perfect with the Wave. If you’re unsure what to buy, get this – you won’t regret it. 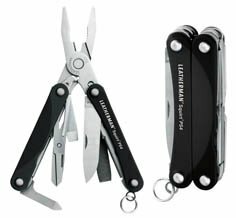 Best price we found on the Leatherman Wave. The Charge TTi is a feature-rich multitool in a light, 8.2-ounce package. It includes a high quality S30V steel knife and a 420HC serrated knife with cutting hook, as well as both a small and a large bit driver with a small selection of bits. There’s 19 tools in all. You also get a medium screwdriver, two files, scissors, a saw, and a can/bottle opener. Next up, the needlenose pliers also serve as a regular pliers, wire cutter, and hard-wire cutter. There is also a wire stripper and a crimping tool. The Charge TTi includes a replaceable pocket clip and quick-release lanyard ring, and features premium sculpted titanium handle scales for great comfort. Basically, the Charge TTi has a better blade, comes with a better sheath and a bunch of bits and is overall a little lighter than the Wave. It has a couple of extra tools and the titanium handle is superior to the stainless steel. But is all this worth an extra $40 or so? Not in my opinion. If you have the money go for it, otherwise stick to the Wave. Best price we found on the Charge TTi. 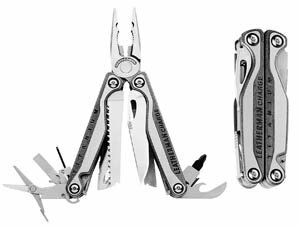 At number three is the Leatherman Skeletool, a lightweight 5 ounce multitool with 7 tools in a 4”, mean-looking package. 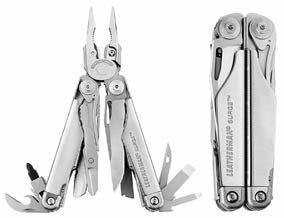 This is Leatherman’s most recent model and is packed with needlenose pliers, regular pliers, hard-wire cutters, and regular cutters. The combination knife is partially serrated and made of 420HC stainless steel. The Skeletool also includes a carabiner/bottle opener and a large bit driver. Add on Leatherman’s optional 21 double-ended bit kit, and you extend the possibilities tremendously. The body of the Skeletool is manufactured of stainless steel, with 6061-T6 aluminum handle scales. The light 5 ounce weight makes this the lightest full-size multitool on the market. This multitool has a belt clip but unfortunately, does not come with a standard sheath, so you’ll have to buy one as an optional accessory. The real attraction here is portability as the Skeletool can easily fit onto your keychain and goes unnoticed in the pocket. Also, at this price it’s a bargain. Sure, you won’t be getting all the practicality of the Wave or Charge TTi but it’s got you covered in most situations. 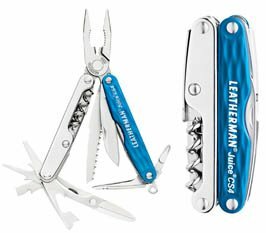 Moving into a smaller, but still full-sized, Leatherman tool, we come to the Juice CS4. The Juice CS4 is designed for people with smaller hands, and is only 3.25” long when closed. You can essential think of the Juice CS4 as a mini-Wave with a few things left out to get it into a smaller package. Don’t let its small stature fool you, though, because it still includes 15 different tools, including needlenose and regular pliers, hard-wire and wire cutters, and a 420HC knife. You also get a saw, scissors, an awl, a bottle/can opener, and even a corkscrew. Rounding out the selection, there are four different screwdrivers, from extra-small to medium/large and Phillips-head. The 6061-T6 hard-anodized aluminum handles make the multitool strong but light, and the handle also includes Type II blue anodized aluminum for a unique appearance. I really do like the Juice CS4 and it’s a close call between it and the Skeletool. They’re both relatively small but the CS4 is a touch smaller than the Skeletool and about half an ounce heavier. 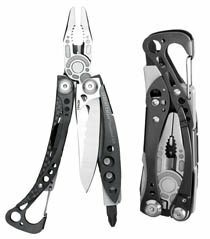 My own preference is the Skeletool and it’s cheaper than the CS4 so I gave it the edge in this list. Best price we found on the Juice CS4. The Surge is one of the big boys and in fact one of Leatherman’s largest models. It’s packed with 21 tools, including the largest pliers in Leatherman’s lineup, 154CM replaceable wire cutters and hard-wire cutters, stranded-wire cutters and an electrical crimper. The multitool also includes two 420HC knives, one serrated and one not, spring-action scissors, and an awl with a thread loop. Add in a can opener, bottle opener, two files, and screwdrivers, plus more, and you’ve got just about any tool you can imagine. The Surge weighs a whopping 12.5 ounces, and is 4.5” long when closed. It comes in either stainless or black, and includes a nylon and leather sheath. Make no mistake, the Surge is a heavy duty beast and for those tougher tasks is the only multitool that will get the job done. I do like it a lot but it’s typically kept in my bag and loses points for not really being an “EDC” tool. There’s a time and a place for the Surge for sure, but it certainly lacks the versatility and portability of its lesser sized cousins. Decent price on the Surge. Next up is the Squirt PS4, the tiniest multitool in our line up yet still with a bunch of awesome features. The Squirt PS4 has spring-action needlenose and regular pliers, as well as spring-action wire cutters. The multitool includes a 420HC knife, spring action-scissors, and a combination flat/Phillips screwdriver. There is also a bottle opener, a wood/metal file, and a medium flathead screwdriver. This tiny multitool weighs only 2 ounces and is 2.25” long closed. The handle scales are 6061-T6 hard-anodized aluminum for durability. It includes a key ring attachment, so you can keep it right with your keys for easy accessibility. This little guy is extremely handy due to its small size and you’ll barely feel it in your pocket. It’ll be next to useless in those heavy duty situations but will tackle most of the routine odd jobs around the house without any problems. Cute yet practical and super affordable. Amazon’s price on the Squirt. The Crunch multitool is a little different from the rest. It’s built around locking pliers (vise-grips) which are large enough to grab a 1-inch pipe. The Crunch has been around for over ten years now and still going strong due to its unique feature set. It’s roughly about the same size as the popular models like the Wave – with a closed length of 4 inches. It weighs in pretty light at only 6.9 ounces and features 15 different tools including a 420HC serrated knife, wire cutters and stripper, hex bit driver, bottle opener and a range of screwdrivers. I really like the Crunch primarily because of the locking pliers and its small size. Rarely do you find a toolset like this including vise-grips in such a small package. Quality engineering and the typical Leatherman fit and feel we’ve come to expect. The Super Tool 300 is another big guy but not as chunky as the Surge. It weighs in at 9.6 ounces, and is 4.5” long when closed. You get 19 tools, including needlenose and regular pliers, 154CM replaceable wire and hard-wire cutters, as well as stranded-wire cutters and an electrical crimper. You also get a wire stripper, two 420HC knives (one serrated), a saw, and an awl with thread loop. You also have your wood/metal file, can/bottle opener, and a host of 4 different screwdrivers. Finally, it’s available in either stainless steel or black, and comes with a nylon/leather sheath. The Super Tool 300 feels like a bit of an oddball to me. It basically sits between the Wave and the Surge in terms of size, weight and number of tools. On the plus side it’s a fair bit cheaper than both of those and I give it much credit for that. If you’re on the fence between a regular size Wave or the big boy Surge then maybe the ST300 it the right guy for you. Supertool 300 at Amazon. Similar to the Skeletool, we have the Skeletool CX. A slightly more expensive brother to the Skeletool, the Skeletool CX replaces the combo blade with a 154CM non-serrated knife. The multitool still includes the needlenose pliers, regular pliers, hard-wire cutters, and regular wire cutters, as well as the carabiner/bottle opener and large bit driver. The handles on the Skeletool CX are stainless steel with carbon-fiber handle scales and Tungsten DLC scratch-resistant coating. This baby still weighs in at a mere 5 ounces, includes a belt clip, but still does not ship with a sheath. 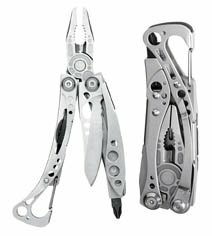 Go for this model if you can afford to drop an extra $20 versus the Skeletool. Still, think a 50% premium over the Skeletool is a bit much for what you’re getting here hence I rank the Skeletool higher overall. Lowest price we found on the Skeletool CX. The Charge AL is a slimmed down version of the Charge TTi which is of course a bit cheaper. It features 17 built-in tools, including scissors that are beveled for extra-close work and are sharp enough to cut through just about anything. The multitool has a 154CM knife and a 420HC serrated knife, as well as both needlenose and regular pliers. For cutting wires, you have hard-wire cutters and stranded wire cutters and a wire stripper. The Charge AL also includes two files, the bottle/can opener, and both large and small bit drivers plus a few essential bits. The pocket clip and quick-release lanyard ring is replaceable, but the multitool does not come with a sheath. To me the Charge AL feels like a wimpier version of the Charge TTi. It’s lacking many of the high end features of the TTi including the S30V blade and titanium handles but an excellent choice if you want something in between the Wave and the Charge TTi. So there you have it, my top ten list of the best multitools available today. Check out my in-depth comparison table below for all the key specs at a glance. Whatever you choose, no doubt it will make an excellent addition to your pocket, utility drawer, or tackle box. And remember, multitools make great gifts for Father’s Day, Birthdays, Graduation and Groomsmen! Victorinox SwissTool RS (approx. $100) – a rock solid tool with 24 tools in a neat package. SOG PowerAssist (approx. $60) – SOG puts emphasis on the blades with quick release ability but the rest is pretty standard. CRKT Zilla (approx. $35) – Knife maker CRKT has done a nice job differentiating from the crowd with this innovative but rather big multitool. Gerber Diesel (approx. 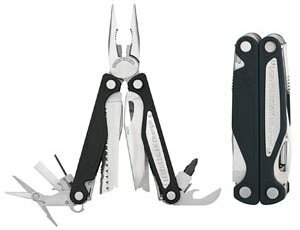 $40) – Very similar to several Leatherman offerings but not as well made in my opinion. In case you’re wondering how I rank these multitools there are a number of factors I consider. It goes without saying that multitools have a lot of moving parts and the build quality is vital if it is going to last. Everything should be nice and tight and the tools should move fluidly without much friction. The sharp tools should lock in place firmly and the tips on the pliers should come together in perfect unison. With the better quality multitools you also greatly reduce the risk of corrosion which is something that plagues all metal objects over time. One of the most used tools is the blade and as with all knife blades it’s all about the steel. You can read my entire guide to knife blade steels but in general 420HC is good, 154CM is better and S30V is the bee’s knees. The better the steel, the longer it will hold its sharp edge. Too many knife and tool manufacturers focus on jamming so much into their products that they overlook an essential component which is the design and ergonomics. A clever design will allow you to maximize the tool-to-weight ratio as well as feeling perfectly comfortable in the hand. The best designs will minimize “dead space” which allows for gunk and fuzz to collect and prohibits effective cleaning. Last but not least is value for money. It’s easy to rank products when money is not an object, but alas we all have budgets and what you get for your hard earned dollar is often the most important metric. I look for those unique models with an ingenious design that give you far more than the competition on a dollar for dollar basis and represent tremendous value for money. So, what are you waiting for? Your mission to find the best multitool is over!